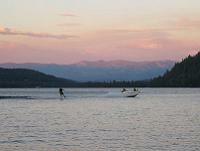 Truckee Lakes offer great views and lots of Truckee Summer Activities! 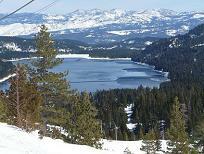 There is no doubt in my mind, that Donner Lake is the Jewel of the Truckee Lakes! Driving north over Donner Summit on I-80, the first look is so incredibly stunning! 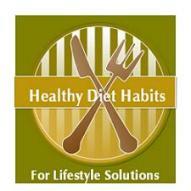 It is a great lake to hike around, bike around, and enjoy the beaches and water amenities. Jet Skiing, Water Skiing, Kayaking, Paddle boating, Stand Up Paddleboarding, and Sailing are popular pastimes at this gorgeous mountain lake surrounded by the Shallenberger Ridge along the side of the lake. Fishing is also a popular pastime at Donner Lake, where some of the biggest Lake Trout in the State of California can be found. The Truckee Donner Recreation & Parks District manages the popular public beach, West End Beach as well as the Shoreline Park area, the Donner Lake Public Boat Ramp, and the Public Piers. 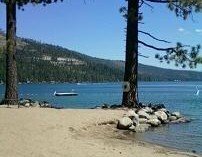 The Donner Lake Homeowners Association has their own private beach for residents of Donner Lake next to West End Beach. 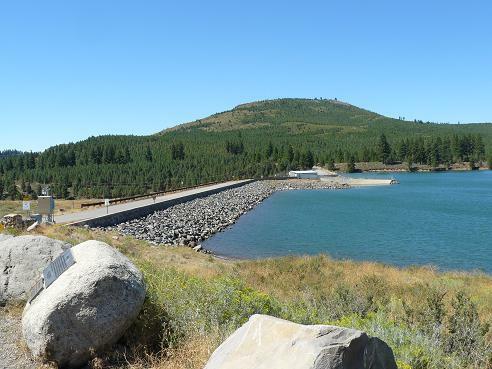 Donner Lake has an annual Triathlon that includes swimming the Lake, running around the lake, and riding bikes up the Old Hwy 40 Road, over the Rainbow Bridge, (pictured below) down to Kingvale, and back down again. 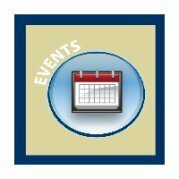 This has been an annual tradition for over 30 years! 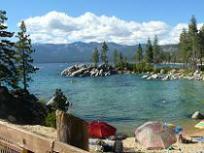 At the East end of the Lake, the Tahoe Donner Homeowners Association has their own private beach area. There is also a great beach in China Cove that can accessed from within the Donner Memorial State Park which is a fantastic park with campgrounds and lots of things to do. I couldn't find an official name for this beach, so I'm calling it the China Cove Beach, until I hear otherwise. 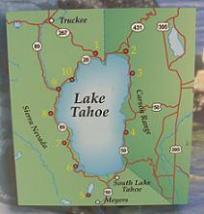 See my Truckee Beaches page, for a map of the Truckee Beaches! We lived out in Glenshire, so we were about 5 minutes away from Boca Reservoir and took our dogs out there often to swim. It is a gorgeous and peaceful area. 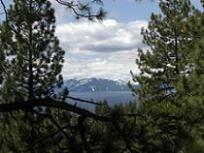 Lake Tahoe - No trip to Truckee would be complete without driving the 20 minutes over to Lake Tahoe. The picture below shows the famous Emerald Bay's Fannette Island, which was the "Tea House" for the Vikingholms Castle on the Emerald Bay, beach. 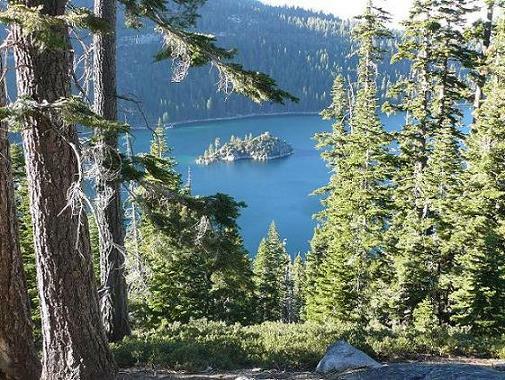 The Emerald Bay State Park is a gorgeous place to Hike! Sand Harbor State Park on the Nevada side of Lake Tahoe about 2.5 miles south of Incline Village, is definitely one of my favorite Tahoe beaches and places to view the Lake as shown in one of my pictures below. 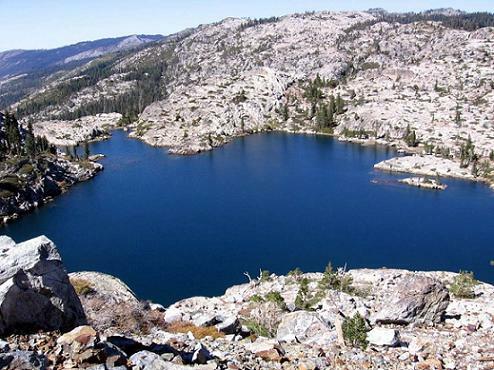 For some pictures of some spectacular lakes in the Sierra Nevada's in the Grouse Ridge and Old Man Mountain area, check out the video on my Truckee Backpacking page!